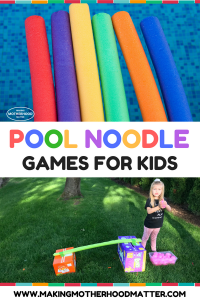 Inside: Discover three super fun and simple pool noodle games that will make your kids smile. With just a few materials, you can keep your kids busy making memories with the pool noodle letters, pool noodle scoop, and pool noodle ramps activities. 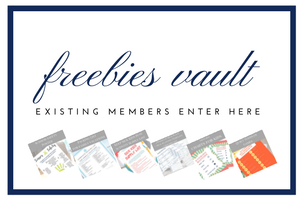 Plus, a free printable. It’s 9:00 in the morning, my son wipes the oatmeal off his chin and pries the back door open. He runs through the grass and grabs his toys. My daughter and I follow him outside and find the materials we need for the pool noodle games. My kids love doing fun activities, especially if they are outside and involve getting wet. These three pool noodle games will not disappoint. They are perfect for toddlers, preschoolers, and early elementary aged kids. I bought our pool noodles from the dollar store, which made these activities not only fun but also really budget-friendly. Or, if you’d rather have them delivered, you can snag them here. The best part? Because I am a former educator, I can’t help myself but include some learning in all the pool noodle fun. Plus, I’ve added a free printable for the pool noodle letters game. This pool noodle game is tons of fun. To prep for this activity, you’ll need to gather the materials and then cut two of the pool noodles in half. Then, you are ready to start bending and shaping the letters of the alphabet. I’ve created a free printable for this game, including how to make each letter of the alphabet. Tap here to download yours. 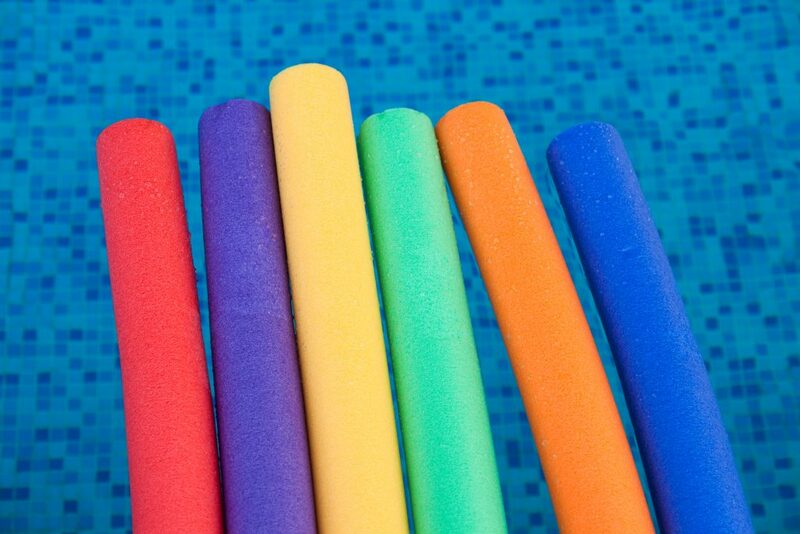 We used pencils to keep the pool noodles in place, by pushing them through the noodle and into the ground. And don’t worry, if it’s not a beautiful day, I’ve got a list over 150 rainy day activities for toddlers. If you want more fun learning games, check out this alphabet letter hunt or how we build letters with magnetic tiles. For the next pool noodle game, we tried the pool noodle scoop. This game is super easy, but it keeps kids happy and busy for-ev-er. First, you’ll want to cut one pool noodle into roughly one-inch pieces using scissors. Then, you fill up a kiddie pool or water table and dump in the parts of the pool noodle. Next, you give the kids some spoons to scoop with (I used a few plastic serving spoons from my kitchen), and they were all set. Kids can scoop the noodles out and then scoop them back in again and again. For over 200 fun summer activities for kids, check out this list that is packed to the brim with fun. Making pool noodle ramps is not only super fun, but it’s also a great STEM activity because kids get to experiment designing and redesigning pool noodle ramps to see which works best. They can test their hypothesis to see which ramp will allow the water balloon to roll the farthest. The sky is the limit for creativity here. To begin, we used a recycled box (a diaper box to be exact, because I’ve got a ton of those). Then, we cut a pool noodle in half down length-wise. This noodle becomes the ramp for the water balloons to roll down. Next, we used tape to attach the pool noodle half to a box. Sometimes, we would use pencils to create the angles we wanted with the pool noodle. Then, my kids would experiment by sending water balloons down the ramp. When they got tired of that ramp, we designed a new one. These games are tons of fun and are sure to keep little ones happy and busy for hours. If you want more ideas for making memories during the summer, check out this summer bucket list for toddlers with 50 summer activities for toddlers. 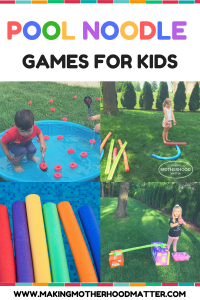 Don’t forget to grab the pool noodle games free printable for this game, including how to make each letter of the alphabet. Tap here to download yours. PS – If you enjoyed this piece, you might also like Over 100 Easy Kids Activities That are Surprisingly Fun.